14 Jul 2016 --- The United States Patent and Trademark Office has issued Kemin Industries a patent for the role of its products in protecting individuals with three common ocular disorders from blue light or light-induced damage. Kemin’s patent (US Patent No. 9,226,940 B2) allows vitamin and dietary supplement manufacturers using FloraGLO and/or ZeaONE to position their products for blue light protection. The patent specifically covers products containing ocular antioxidants including lutein and zeaxanthin employed to protect the eye from light-induced damage, particularly the damage caused by the blue wavelengths of light. The patent targets individuals with presbyopia, hyperopia or astigmatism. In these three conditions, blue wavelengths of light are focused directly onto the macula, creating a higher risk for ocular damage. Blue light impacts the majority of adults ages 45 and older who have presbyopia, commonly known as age-related farsightedness. “Because of the widespread prevalence of presbyopia, this patent opens the door for FloraGLO and OPTISHARP Natural customers to make blue light eye protection claims when targeting consumers 45 years and older,” said Dr. Richard Roberts, Patent Inventor and Principal Manager of Scientific Affairs and Technical Services for the Human Nutrition and Health division of Kemin. Nearly every source of light—whether natural or artificial—emits harmful blue wavelengths of light. The growing prevalence of digital devices like computers, tablets and smartphones is exposing individuals to more blue light than ever before. Over half of Americans use digital devices more than five hours a day and 70% use two or more devices at the same time. In addition to blue light from digital devices, the use of the light emitting diode (LED) in indoor lighting is another growing source of blue light exposure. LED bulbs contain 35% blue light levels as compared to 3% levels in traditional incandescent bulbs. In North America alone, LED lighting made up a US$4.8 billion market in 2012 and is expected to make up a US$42 billion market by 2019. As blue light levels and sources continue to grow, children are especially vulnerable to the effects. Blue light exposure is especially concerning for infants and young children, as nearly every child is born with hyperopia, commonly known as farsightedness. 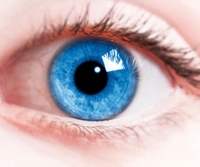 Because of the condition, they are at a higher risk for blue light and light-induced damage as their eyes develop.